Modern agricultural practices are the only reason the earth can feed more than seven billion souls while still leaving any room for nature. By returning to our pastoral roots we risk setting back environmental progress while negatively affecting human and ecological health. In my blogs I try to look at modern environmental tropes from a scientific perspective to see how they stand up to the data. 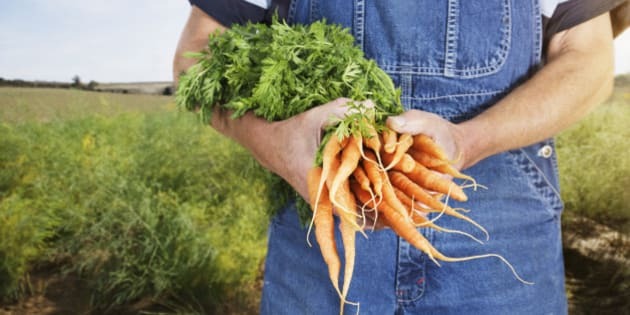 Some of the most befuddling myths to come out of the modern environmental movement are the "smaller is better," "local is better," "organic is better" memes in agriculture. The problem is that the research on the topic says exactly the opposite. Modern agricultural practices are the only reason the earth can feed more than seven billion souls while still leaving any room for nature. By returning to our pastoral roots we risk setting back environmental progress while negatively affecting human and ecological health. The minimum amount of agricultural land necessary for sustainable food security, with a diversified diet similar to those of North America and Western Europe (hence including meat), is 0.5 of a hectare per person. This does not allow for any land degradation such as soil erosion, and it assumes adequate water supplies. Consider that, as of the year 2000, the U.S. Northeast had a population of 49.6 million people who live with a population density of 359.6 people/km2. This translates to 0.69 acres per person. If those Americans returned to the land there would barely be enough land to support them with a minimal diet. Moreover, this "pastoral" lifestyle would not be conducive to centralized services like sewage and water. Without modern sewage treatment and water supplies the population would undergo massive "degrowth" as diseases and weather slowly eliminated the majority of the population. From a naturalist's perspective, once you discounted the areas where humans cannot farm (bogs, lakes etc.) there would not be an unallocated acre on the Eastern Seaboard. There would be no room for nature of any sort. I don't see that existence as being in harmony with nature as much as being utterly antithetical to nature. Regarding the importance of "localized" food and food security, large-scale farming, with its ability to maximize crop yields and thus reduce land needs, is a necessity in a world of seven billion souls. Anyone interested in this topic should read The Locavore's Dilemma by Desrochers and Shimizu. They comprehensively deconstruct the environmental arguments for the 100-mile diet and the concept of "food miles." Activists who complain that the food then needs to be moved by ship or airplane are refuted by Desrochers and Shimizu who point out that 82 per cent of the estimated 30 billion food miles associated with U.K.-consumed food are generated within the country, with car transport from shop to home accounting for 48 per cent and transport to stores/warehouses representing 31 per cent of food miles. Considering carbon dioxide equivalents, the reality is that food grown in greenhouses in B.C. need fossil fuel energy to grow while similar crops from Mexico/Chile use much less energy. Research from the U.K., comparing local tomatoes with those imported from Spain, showed the U.K. tomatoes, which had to be grown in heated greenhouses, emitted nearly 2,400 kg of carbon dioxide per ton, compared to 640 kg for the Spanish tomatoes, which could grow in unheated greenhouses. For those who suggest that organic is "healthier," the research is definitive on that score as well. Organic foods are no healthier than food from non-organic farms. Meanwhile, the widespread use of "natural" fertilizers in organic farms can lead to the contamination of groundwater supplies with nitrates and, in exceptional cases, animal wastes and e-coli. While factory farms have their own fertilizer/waste issues, they tend to be much more tightly regulated and have the financial wherewithal to invest in the most efficient treatment systems. As for the suggestion that local food would be more affordable than commercially bought food, the primary driver for food prices are input costs and small, inefficient farms have higher costs per bushel for virtually every foodstuff known to mankind. For proof I suggest you go to your local community market and compare the costs of the market vegetables as opposed to those at your local grocery store. Alternatively, look at the charts in Desrochers and Shimizu or go look on the shelves in the organic foods section in your local supermarket. As I describe above, locavores and 100-mile dieters continue to suggest that local is better for you and better for the environment. Local food may make you feel better about yourself, but it tends to use more energy and fertilizer per bushel to produce and deliver to your table; is no healthier than the alternatives; is less efficient, necessitating more land per bushel to produce; and every acre of nature carved out for a small, inefficient hobby farm is one less acre where nature can be allowed to flourish.